High-temperature superconductivity in cuprate superconductors was discovered almost exactly 20 years ago, but a satisfactory theoretical explanation for this phenomenon is still lacking. Observations of the isotope effect in conventional superconductors (Nb3Ge for example) have played an important role in establishing the electron-phonon interaction as the dominant contribution to the mechanism of superconductivity in these materials. Up to the present, however, conflicting experimental and theoretical results have not allowed a confirmation of the role of electron-phonon coupling in cuprate superconductors. In work published on March 2 in the Proceedings of the National Academy of Sciences, Xiao-Jia Chen and colleagues at Carnegie have calculated the oxygen isotope exponents and transition numbers for a number of optimally doped cuprates using a theoretical model that incorporates a phonon-mediated d-wave pairing potential (Figures 1 and 2). 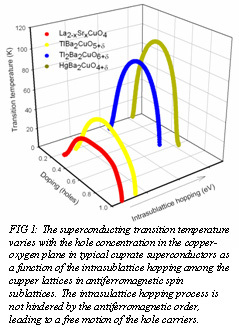 Using diamond anvil cell techniques, the group also investigated the behavior of the superconducting transition temperature and Raman spectrum with pressure, and found that the isotope effect and pressure effect on the transition temperature are closely related. 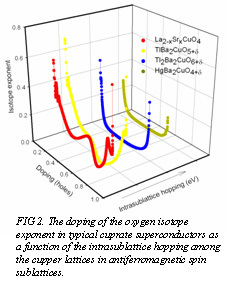 In correlating results from experiment and theory, the work shows that the oxygen isotope effect is controlled by next nearest neighbor (Cu-O-Cu) interactions, and indicate that phonon-mediated processes are likely important in the mechanism of high-temperature superconductivity.